How much does it cost to travel to Tallinn? How much money will you need in Tallinn? €71 ($80) is the average daily price for traveling in Tallinn. The average price of food for one day is €25 ($28). The average price of a hotel for a couple is €73 ($82). Additional pricing is in the table below. These average travel prices have been collected from other travelers to help you plan your own travel budget. How much money do I need for Tallinn? Tallinn, the capital of Estonia, is located on the southern coast of the Gulf of Finland. It has a population of more than 430,000 people and is a charming, yet cosmopolitan place to visit. The Old Town is at the center of the city's tourism, and the beauty and architecture is very impressive. The city's close proximity to Helsinki make it a popular day trip from Finland, but cheap plane flights have also encouraged visitors from around Europe to spend several days in this city. In particular, summer months can become quite crowded. The city's climate is humid continental. The summers are warm and mild, and the winters are very cold and snowy. The average temperature in February is -4 degrees Celsius and in general the temperatures stay around the freezing point during the winter months. Spring can stay quite cold and it is not uncommon to see freezing temperatures in March or even April. By late May the temperatures will warm up and the snow has stopped. Summers are mild and temperatures stay around 20 degrees Celsius. July is usually the warmest month. Fall starts out pleasant but becomes much colder and cloudier throughout November. Tallinn has a wonderful old town that is well preserved and listed as a UNESCO World Heritage Site. 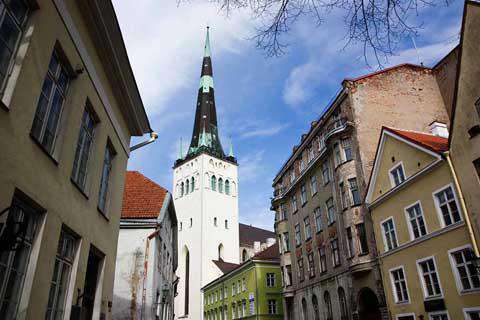 Most people visit Tallinn specifically to see the old town. At its heart is the Hill of Toompea which is covered with alleyways, cobblestone streets, and quaint old world houses. You can wander your way to the top of the hill where you'll be rewarded with a breathtaking view of the city. As you head down the hill you'll wander through shops, churches, homes, and town squares. The old town is still somewhat surrounded by the remains of the old wall that once protected the city. Once you're outside of the walled in area, you will find many pleasant green parks that are great places to relax and pass some time on a lovely afternoon. Popular sights within the Old Town include Viru Gate, the Town Hall, Alexander Nevsky Cathedral, St. Mary's Cathedral, the Museum of Occupations and the City Wall. As a tourist, you're likely to spend most of your time in the city's Old Town. There are many restaurants, shops and sights throughout this area. The City Centre is where you'll find many modern office buildings, skyscrapers, and shopping malls. This area lacks the atmosphere and character of the Old Town. Kadriorg is a residential area that has wooden houses and larger apartment buildings. It's also where you'll find the baroque Kadriorg Palace and the Estonian Art Museum Kumu. The neighborhood of Pirita has a nice, sandy beach and the Olympics Regatta Centre. It's a wealthy part of town with many private residences. Lasnamae, Mustamae and Oismae all have soviet-era apartment buildings and Kalamaja has smaller wooden buildings that range from well maintained to run down. In addition to the old town charm, many people head to Tallinn for its wild nightlife. The city is filled with clubs and bars that attract tourists from all over Europe and the world. Beers are cheap, the city is vibrant, and the nights can become quite crazy and fun for thrill seekers. Do keep your wits about you, however, as many visitors have been scammed out of large sums of money. If you make friends with strangers, do remain somewhat skeptical of their intentions and research the scams that are known to take place in the area. If you think through your actions you're sure to be fine and have a great time. Tallinn has many great restaurant options. Many offer traditional Estonian food, which includes pierogis, dumplings, and hearty meat dishes, but you'll also find no shortage of international options and even the odd fast food restaurant here or there. Prices are often cheaper if you head outside of the old town, but they may also loose some of their charm and atmosphere. It's easy to walk around the Old Town and public transportation is almost nonexistent within this area. Outside of the Old Town there is a good network of buses, trams, and trolleybuses. The system operates between the hours of 6 am and 12 am. Tickets are interchangeable and can be bought at kiosks that are found throughout the city. The trams are located within the city center and there are four routes, which cross at Viru Center. There are seven trolley lines that travel throughout the city. Taxis are also plentiful and relatively cheap, although you should confirm the price before committing to a trip. If you're looking for a cheap way to learn a little more about Tallinn you can find a free walking to that is led by local students. The guides are very knowledgeable and bring the city to life with tales and legends that date back to medieval times. You'll learn random facts about the city, but you'll also get tidbits and information on where to hang out, and the places with the best night life. The tour is about two hours and can be picked up every day at noon at the Tallinn Traveler Info Tent between them months of June and August. Between September and May the tour starts at the Tourist Info Center. The tour is free, but tipping the guide is recommended.